Acute kidney injury (AKI) arises from multiple forms of renal damage, including ischemia, toxin exposure, and urinary tract obstruction. AKI-associated inflammation exacerbates damage and can lead to development of chronic kidney disease (CKD). Kidney injury molecule-1 (KIM-1) is a mucin and immunoglobulin domain-containing transmembrane protein that is highly upregulated in the proximal tubule after kidney injury. While chronic KIM-1 expression promotes renal fibrosis and kidney failure, Li Yang, Craig Brooks, and colleagues at Harvard Medical School reveal that KIM-1 dampens early inflammatory responses and protects the kidney following injury. Mice expressing a mutant form of KIM-1 that lacks the mucin domain (KIM-1Δmucin) were more susceptible to both ischemia-induced and toxin-induced AKI compared to control animals. Loss of the mucin domain disrupted KIM-1-mediated phagocytosis in proximal tubular cells. This reduction in phagocytosis in KIM-1Δmucin mice reduced clearance of apoptotic and necrotic cells and luminal debris after injury, leading to increased immune infiltration and inflammation. Moreover, KIM-1-mediated phagocytosis in proximal tubular cells from WT mice triggered PI3K-dependent downregulation of NFkB activity, resulting in an anti-inflammatory phenotype that was characterized by decreased expression of TLR4 and pro-inflammatory cytokines, and reduced macrophage activation. Taken together, these data establish a protective role for KIM-1 in response to AKI. The accompanying image shows post ischemic kidney tissue from WT mice that was stained for KIM-1 (red), active caspase 3 to label apoptotic cells (green), and DAPI (blue). 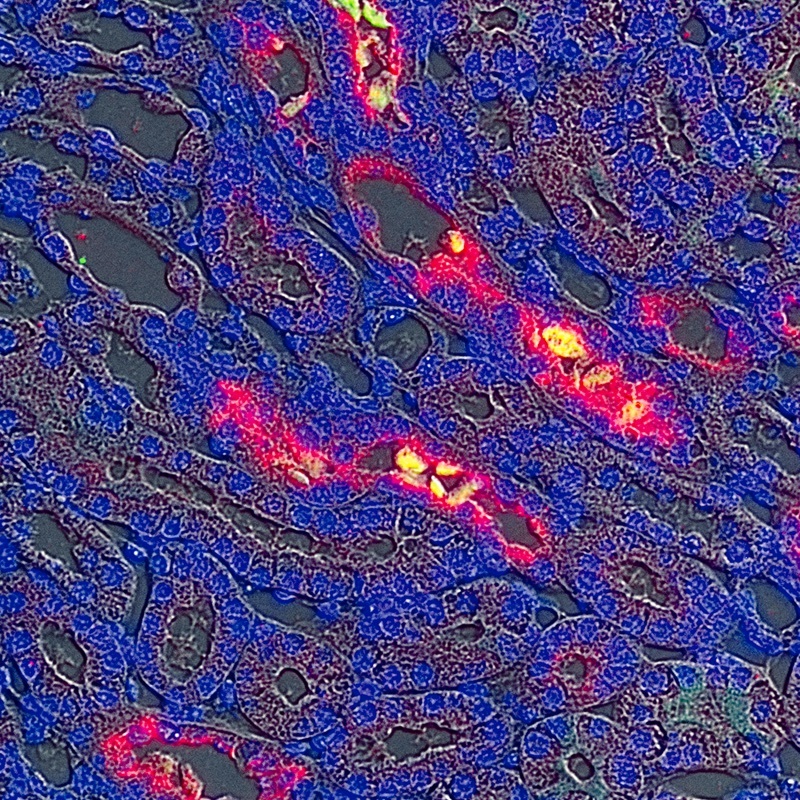 Differential interference contrast (DIC) microscopy was used to visualize kidney structure and the DIC image was overlaid with the fluorescent images. KIM-1-expressing proximal tubule cells bind caspase 3 positive apoptotic cells. Citation Information: J Clin Invest. 2015;125(4):1620-1636. https://doi.org/10.1172/JCI75417. Kidney injury molecule 1 (KIM-1, also known as TIM-1) is markedly upregulated in the proximal tubule after injury and is maladaptive when chronically expressed. Here, we determined that early in the injury process, however, KIM-1 expression is antiinflammatory due to its mediation of phagocytic processes in tubule cells. Using various models of acute kidney injury (AKI) and mice expressing mutant forms of KIM-1, we demonstrated a mucin domain–dependent protective effect of epithelial KIM-1 expression that involves downregulation of innate immunity. Deletion of the mucin domain markedly impaired KIM-1–mediated phagocytic function, resulting in increased proinflammatory cytokine production, decreased antiinflammatory growth factor secretion by proximal epithelial cells, and a subsequent increase in tissue macrophages. Mice expressing KIM-1Δmucin had greater functional impairment, inflammatory responses, and mortality in response to ischemia- and cisplatin-induced AKI. Compared with primary renal proximal tubule cells isolated from KIM-1Δmucin mice, those from WT mice had reduced proinflammatory cytokine secretion and impaired macrophage activation. The antiinflammatory effect of KIM-1 expression was due to the interaction of KIM-1 with p85 and subsequent PI3K-dependent downmodulation of NF-κB. Hence, KIM-1–mediated epithelial cell phagocytosis of apoptotic cells protects the kidney after acute injury by downregulating innate immunity and inflammation.